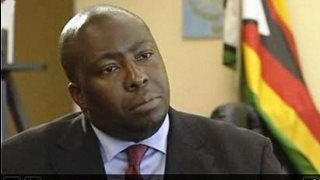 AFRICANGLOBE – Zimbabwe’s environment minister Saviour Kasukuwere was detained Saturday morning at Munich International Airport in Germany after arriving on a flight from South Africa. Kasukuwere said he was held for three hours after arriving on Germany on his way to Poland to attend the United Nations Framework on Climate Change Convention. Narrating his ordeal to the Sunday Mail, Kasukuwere said: “Problems started when I landed at Munich International Airport around 6am (on Saturday). “As we were walking from the arrival terminal, police details and security agents appeared as if they were carrying their usual airport checks but as soon as they got hold of my passport, they all swooped on me. “They stopped searching all the other people and I suddenly became the centre of attraction as they escorted me to a police post within the airport and they detained me in a small room for two and half hours. “As soon as we got into this room, they took away my passport and gave me some document saying I was supposed to be subjected to some security checks. The police details consulted with higher authorities and shuttled from one office to the other. “I asked them what was the problem and they told me that their security system had alerted them that an undesirable element was about to enter into their country. “They searched me and checked all my details and after a while, they left me to sit alone in this tiny room not knowing what was going on. “It was quite some experience but I wasn’t surprised. I then spoke to the Germany Ambassador in Zimbabwe who made frantic efforts to call these police details to no avail. I sat in this tiny room on some bench and all I could do was just to read my prayer book. “After about two and half hours of uncertainty, one of the police officials just came in and handed me my passport. He then hurriedly left and I was really taken aback by this treatment. “I think this had something to do with the illegal sanctions but no one mentioned this to me. This was quite some experience. Kasukuwere said he was only released just before 9am. The European Union (EU), of which Germany is a leading member, imposed sanctions against Zimbabwe which include travel bans against Zanu PF and top government officials. The sanctions were suspended ahead of the July 31 polls, in a move the EU hoped would encourage the government to hold credible elections. However, with no evidence whatsoever the EU has backed opposition claims that the vote, won with a landslide by President Robert Mugabe and his Zanu PF party, was fraudulent. Previous articleAre We Witnessing A Power Shift In Africa’s Great Lakes Region?